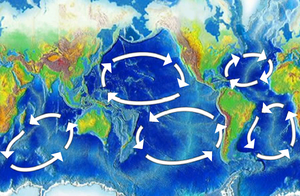 A gyre is a large system of ocean currents moving in a circle. Gyres are caused by the Coriolis effect. Because the Earth is rotating, ocean currents in the northern hemisphere tend to move in a clockwise direction and currents in the southern hemisphere in an anti-clockwise direction. The Coriolis force acts most strongly on the wind, and the wind then creates a torque that tends to spin the ocean currents. The Earth rotates from the west towards the east, and the Coriolis effect becomes more intense toward the poles. Because of this, gyres form strong currents on the western side of oceans, so they are pushed against the eastern coast of continents. The vorticity (the strength of the torque force) is balanced out by frictional surface currents, which normally act against the spin of the water. However, in the middle of the ocean, the effects of friction are very weak. The term gyre can be used to mean any type of vortex in the air or the sea, but it is most used in oceanography for the major ocean current systems. Tropical gyres tend to be mostly east-west with minor north-south extent. The centre of a subtropical gyre is a high pressure area, which the ocean moves around. The high pressure in the centre is due to the westerly winds on the northern side of the gyre and easterly winds on the southern side of the gyre. These cause frictional surface currents towards the latitude at the centre of the gyre. Subpolar gyres form at high latitudes (around 60°). The ocean moves around a low pressure area. Surface currents generally move outward from the centre of the system. Wikimedia Commons has media related to Oceanic gyres. ↑ 1.0 1.1 "Gyres and the Coriolis effect". Blue Planet: Infobursts. British Broadcasting Corporation. Retrieved 6 October 2013. ↑ 2.0 2.1 2.2 Geoffrey K. Vallis. Climate and the Oceans. pp. 83–85. ↑ B. Heinemann; Open University (1998). Ocean circulation. Oxford University Press. p. 98. ↑ Lynne Talley, Physical Oceanography Research Division. "The five most notable gyres" (PowerPoint Presentation). University of California, San Diego. Retrieved 6 October 2013. This page was last changed on 2 March 2019, at 20:18.